It is a sunny Sunday afternoon on Stickball Boulevard in the Bronx, and the future of a sport steps up to the plate. Jayden Carrasquillo inches closer to the dry paint on the scorching blacktop and taps his stick once, twice, as his parents, Russell and Jennifer, look on. Jayden is a budding baseball player in his own right, but this is a family thing, a pride thing, and a hit here would mean far more than on a baseball diamond. Today is Jayden's first game with the Silver Bullets up in the bigs -- the New York Emperors Stickball League. Later, he will also play in the NYESL kid's league, which was reinstated this year to get some younger blood excited about the game. Stickball was once an integral part of the urban youth experience. Images of ragtag groups of children playing in the street became iconic depictions of New York City and helped shape the world's perception of New Yorkers as the street-smart, rough-and-tumble class of America. Slowly, like so much of Americana, it has faded from the streets, cars and buses rendering the roadways perilous, Xboxes and iPhones commandeering kids' attention. If not for the dedicated few who still come out to Stickball Boulevard and who populate a handful of other leagues across the country, the game would have faded away by now. On this Sunday, on this patch of cement, with the barbecue cooking and salsa music blaring, it lives and breathes. A player from the New York Emperors Stickball League tapes up his stick before a game. Stickball is often referred to as a poor-man's game because there is no special equipment required. All you need is a broomstick, a rubber high-bounce ball -- Sky Bounce has become the desired ball, replacing the Spalding Hi-Bounce Ball, otherwise known as the Spaldeen -- and a street that is preferably, but not necessarily, empty. 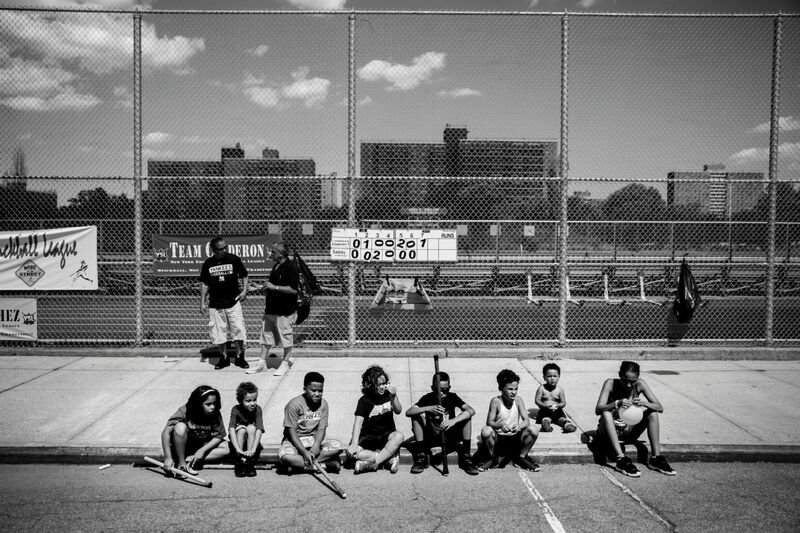 The youth league plays on Stickball Boulevard in the Bronx every Sunday after the adult games. Parents and children come from all over -- upstate New York, Pennsylvania, New Jersey, all five boroughs -- to play a game that was often passed down to them by their fathers and grandfathers. Entire family trees are out here in the Bronx every Sunday from April to August. Team captain Aaron Rivera writes the lineup onto the pavement on Stickball Boulevard. The makeup of teams changes week to week depending on which kids are available to play, although a core group whose parents are dedicated stickball players are usually in the mix. Jennifer Lippold, president of the NYESL, is one just a few women to play in the adult league. She is passing the game on to her son, Ceph Lippold, and the rest of her children. With her bandana on and sleeves rolled up -- "I get this damn stickball tan," she says -- she patrols the three different fields, acting as a heady presence. When she's not playing, that is. These are the kids who are inheriting the love for the game -- and the talent required for it -- to keep stickball around for the generation to come. Hailing from the Bronx, Brooklyn and the surrounding areas, all they need is a broomstick, a Sky Bounce and a dream. (Top, L-R) Jayden Carrasquillo, 13; Amelia Carrion, 11; Anthony Rodriguez, 10. (Bottom, L-R) Sebastian Fontanez, 9; Aaron Rivera, 14; Michael Angel Olivero, 7. Jayden Carrasquillo and Ceph Lippold (right) field fly balls in between the adult games in the New York Emperors Stickball League. Stickball rules dictate that a ball is fair if it stays between the lines, even if it hits a tree or the fence. Many stickball veterans aim for trees to cause the ball to carom farther. C.J. Santiago and friends watch the adults in the New York Emperors Stickball League. Santiago has only been playing the sport for less than two months, but he has grown to like it. He and other kids shout from the sideline at batters playing against their fathers, hoping to distract them as they swing. C.J. Santiago plays a game of hide-and-go-seek with friends near a mural of Steve Mercado, a past president of the NYESL. Mercado, a firefighter with Engine 40, Ladder 35, was killed in the Sept. 11, 2001, terrorist attack on the World Trade Center. Games on Stickball Boulevard, also known as Steve Mercado Way, have been dedicated to Mercado ever since. Mick Olivera, who has played in the NYESL since 1993, said, "Once 9/11 happened and Steve passed, we decided to make this stay around for his legacy." Mercado penned a poem titled "Our Game," which read, in part: "STICKBALL's the game, and each week we play/Running, hitting, laughing, enjoying the day/Our families, our friends, we love them the same/Look forward to seeing you Sunday to play 'OUR GAME.'" Anthony Nazario Jr., a player with the NYESL's Diamondbacks, also serves as a mentor and organizer for the youth league. He works with the kids on a series of drills, from catching fly balls to waiting patiently for a hit to trickle down from a nearby tree branch. Sebastian Fontanez practices in between games of the adult league. There is no pitcher in stickball -- the batter bounces the ball in front of him or her and sizes it up. They are given three attempts or "pitches," but only one swing. Grown men end up twisted like Windsor knots, firefighters and police officers brought to their knees by their own bounces. Ceph Lippold charges toward home as he caps off a home run in the NYESL youth league. Lippold's mother, Jennifer -- the league president -- feels a sense of stewardship over the league; her father, Henry Rosado, was one of the organization's founders in 1985. This is Jennifer's second stint as league president -- her first was from 2002-04. It was her idea to introduce the youth program back into the league. Stickball Boulevard serves as a living monument to New York City firefighter Steve Mercado, who died in the Sept. 11 attacks at the age of 38. Mercado served as president of the NYESL and was an avid player, believing strongly that the game helped keep kids out of trouble. His poem, "Our Game," an ode to stickball, is painted on a wall just outside the Stickball Boulevard fence, next to a mural of Mercado playing. Mercado's sons, Skylar and Austin, both play in the NYESL. Aaron Rivera lies down right in the center of Stickball Boulevard in between innings. The street, located in the Clason Point neighborhood of South Bronx and a part of Newman Avenue, was renamed in the late 1980s to honor the sport's impact on the community. Children buy flavored shaved ice from a man who stops by on Sundays with a pushcart. Dozens of families dedicate their entire summers to the sport. Picture a huge block party, with children and adults of all ages. To cap off the end of the regular season, the NYESL celebrated with a barbecue. Vido Creales helped roast an entire pig for the occasion, pouring beer on top to add flavor. The pork was only ready to serve once they put on the finishing touch: a stickball in the pig's mouth. After hitting a home run, Sebastian Fontanez is hoisted into the air by his father, Ty Davis. Sunday stickball means bonding time for Davis and his son. He shares custody with the boy's mother. "This binds us together," Davis said. Adults in the NYESL only get to take three attempts at dropping the ball for the perfect bounce before taking a swing. The youth league gets a bit more leeway -- the kids are encouraged to pay attention to the slope of the street and how the ball will move before swinging the stick. Jayden Carrasquillo, 13, and his father, Russell Carrasquillo, play together on the Silver Bullets. A longtime member of the NYESL, Russell has played stickball for two decades. He beamed with pride as Jayden approached the plate for his first at-bat with the adult Silver Bullets, clapping hard twice and cheering him on. Young Jayden had shown flashes of skill in practice but looks like a natural among men twice, thrice, almost four times his age. His presence on the Silver Bullets is not taken lightly. "This is not a rite of passage," Russell Carrasquillo said. "You have to be able to play." After Jayden Carrasquillo recorded his first hit in his first at-bat in the NYESL, his father, Russell, jumped up and down, yelling, "That's my kid! That's my kid!" before scrambling to acquire the ball to save as a keepsake. Jayden's mother, Jennifer, had a tear in her eye, and Jen Lippold yelled over at Russell, "He's already better than you!"